In Dec 1976, India beat NZ by 216 runs in a 6 day test at Chepuak and remember John Parker playing in that…. Chanced upon a photo of his, albeit, reference was somebody more popular – that of a fiery pacer booting the wickets !! – that happened at Carisbrook, Dunedin's main sporting venue, the home of Otago's cricket and rugby sides. In IPL 2016, Kings XI Punjab opted to bowl against Kolkata Knight Riders on an Eden Gardens pitch. While that seemed a straightforward decision by M Vijay, his team's combination was rather striking for what it lacked : a fourth overseas player. Shaun Marsh was ruled out of the IPL with a back injury two days ago, but his spot has been taken by uncapped Indian top-order batsman Manan Vohra. Glenn Maxwell, Marcus Stoinis and David Miller were retained. One could recall that in sharp contrast, in Champions League 201, Mumbai Indians sought and obtained permission to field five overseas players because several of their Indian players had suffered tournament-ending injuries. MI were without six of their first-choice players, including the captain Sachin Tendulkar, and their reinforced squad contained seven Indians and seven foreign players. John Parker was among the 3 brothers who played first class cricket in New Zealand. He was a fine fielder, who could also keep wickets. His eventual Test debut -- against Pakistan in 1972-73 -- was not so successful, as he broke a bone in his hand while fielding and was unable to bat. He was the Vice-captain to Turner in Pakistan and India in 1976-77, Parker led his country in one match, against Pakistan at Karachi. He later became an amusing TV commentator. The Umpire in that infamous incident in Dec 1980 was Goodall, who at times was considered to be his Nation’s best. There were also opinion that in those days Umpires of NZ and Oz were too prejudiced. In that eventful morning of the opening Test, Hadlee appealed three times for lbws and Goodall gave them all. (In total, there were to be 12 lbws in the match, with Hadlee claiming seven of them; a Test record for the time.) Clive Lloyd’s men were seething, and events came to a head on the final afternoon when, with New Zealand chasing just 104 to win, Michael Holding, in Colin Croft’s words, “tore the glove off” Kiwi batsman John Parker, only for the catch behind to be rejected. In an unrelated incident, John Parker, the former New Zealand captain, was in news sometime back, having apologised to Mike Hesson for comments made in his document "The Taylor Affair" which follows on from his apology to Brendon McCullum that ended the threat of legal action. In a written statement, Parker confirmed that he was not aware of any facts that could support inferences contained in "The Taylor Affair" that Hesson had been dishonest, improperly motivated or acted in a manipulative way. This week, RCB captain Virat Kohli has been fined INR 24 lakh (USD 36,000 approx) for his team's slow over rate in the game against Kolkata Knight Riders on Monday night. Kohli had already been found guilty of an over-rate offence earlier in the competition, when he was fined INR 12 lakh. Another such instance will fetch him a one-match suspension. The rest of the Royal Challengers team were fined INR 6 lakh each. Opposition captain Gautam Gambhir also picked up a fine after Monday's game, for breaching the code of conduct article related to "abuse of cricket equipment or clothing, ground equipment or fixtures and fittings during a match". Going by the code of conduct – abuse of Cricket equipment, clothing, ground equipment or fixtures and fittings. The knocking of stumps, or the throwing or kicking of a bat, ball, helmet, boundary flag, rope or any equipment on the field of play. – are all level 1 offences. There are various listed offences including breach of IPL clothing regulations. 2.1.2 Abuse of cricket equipment or clothing, ground equipment or fixtures and fittings during a Match - includes any action(s) outside the course of normal cricket actions, such as hitting or kicking the wickets and any action(s) which intentionally or negligently results in damage to the advertising boards, boundary fences, dressing room doors, mirrors, windows and other fixtures and fittings. 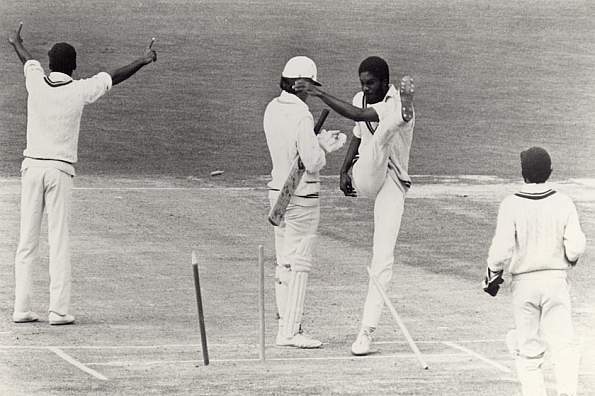 Getting back to that iconic image in cricket lore, and perhaps the most acrimonious incident in New Zealand Test cricket history, Michael Holding, the great West Indian fast bowler, kicking the stumps in anger after having an appeal turned down at Carisbrook in 1980. His anger is visible, raw. It is a photograph that captures frustration so beautifully. A once-in-a-lifetime click of the shutter. Holding's outstretched left arm covers the face of a helmeted batsman, bat tucked under one arm, adjusting his glove, clearly not wanting to get in the fast bowler's way. Though he remains a pivotal character in the story behind the photograph that has become entrenched in the annals of Test cricket infamy, the name of that batsman is not one that will cue an immediate reaction. He is John Parker, who played 36 Tests and 24 ODIs for New Zealand, and to this day he insists that he did not nick the ball that Holding and the rest of the West Indies team believed he had. For Parker, facing Holding and his fast bowling team-mates was the scariest thing he's done on a cricket field. WI could not believe that he was not given out and a furious Michael came up and booted all the stumps out of the ground. With Geoff Howarth, Parker put on 120 in the next session and the New Zealand captain went on to make 147 to help his team to a first-innings lead of 232, putting the Test out of West Indies' reach. During the afternoon session, on 68, Howarth gloved a catch to Deryck Murray. The umpire Fred Goodall did not hear anything, but West Indies were certain, in particular the bowler Joel Garner. Later in the day, Colin Croft was to shoulder-charge Umpire Goodall. Collated from NZ Herald; Cricbuzz and many sources.